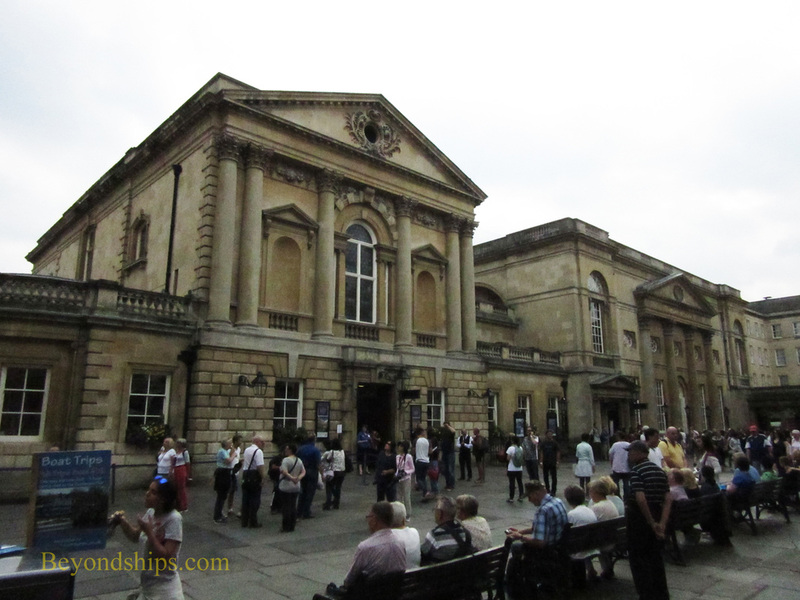 The Roman Baths is Bath's most important attraction. A million people visit this site each year. According to legend, the mythical King Bladud used magic to create the hot spring at Bath in around 863 B.C. An alternative but more complicated explanation is that the spring is a product of natural forces. Rainfall on the nearby Mendip Hills seeps down into the limestone that covers the area. There it becomes heated under pressure to 156 to 205 degrees Fahrenheit (69 to 96 degrees centigrade). The water then rises to the surface through fissures and faults in the limestone. The whole process takes thousands of years. The ancient Celts were probably the first to worship at this inexplicable natural wonder. They attributed it to their goddess Sulis. When the Romans arrived in the 1st century, they decided that Sulis was actually their goddess Minerva. Accordingly, in about 69 AD they built a grand temple by the spring dedicated to Sulis Minerva. 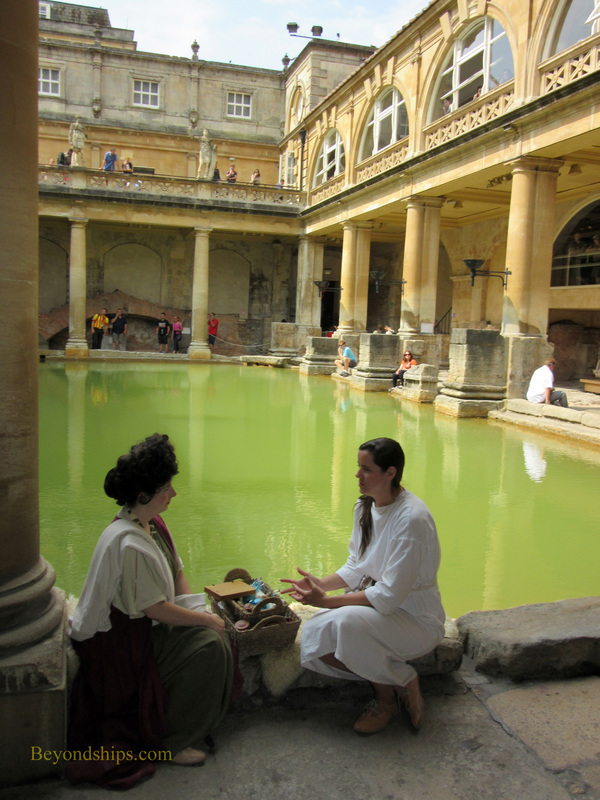 Over the next 300 years, the Romans also built a large bath house around the spring where the residents of the town of Aquae Sulis could come to socialize and take the waters. 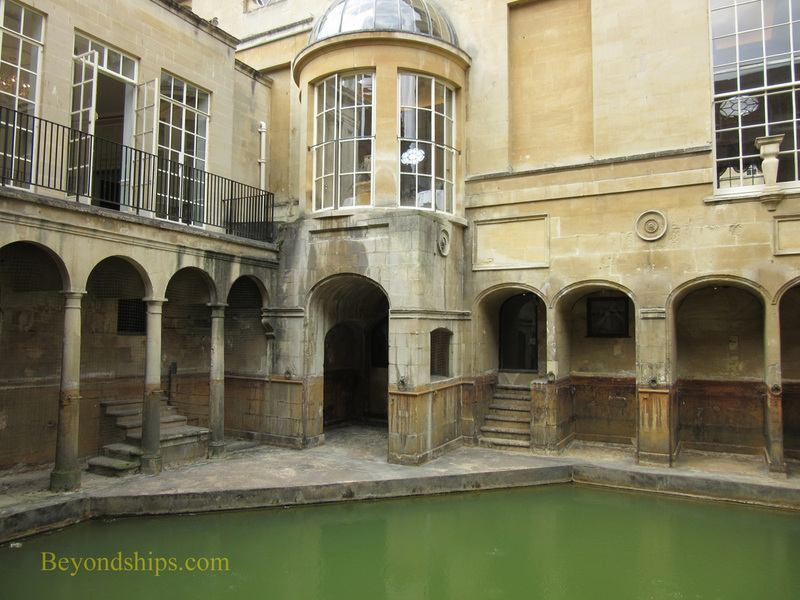 After the Romans left Britain, the baths fell into decline and according to the Anglo-Saxon Chronicles, the Roman baths were destroyed in the 6th century. In the 18th century, the baths had a rebirth. People believed that the spring water had curative powers. However, the water's therapeutic powers were unleashed not so much by swimming in it but by drinking it. Therefore, a building with a fountain (the Pump Room) was erected next to the spring so that the rich and fashionable could come to drink the water. During the construction of a replacement building in the 1790s, part of the long-forgotten Roman temple was rediscovered. It was not until the late 19th century that serious excavation of the ancient site began. The excavations now extend under the surrounding streets and squares. Above: The Romans used to meet and socialize at the Baths. Below: The Georgians built the Pump Room overlooking the thermal spring. Above: The Victorians placed 19th century Roman-themed statues overlooking the Great Bath.